As the National Arts Month closes, the Metropolitan Museum of Manila is also closing one of its most successful exhibitions for 2015, “BenCab: The Filipino Artist” which is now on its final week at the MET. The retrospective exhibition features a broad spectrum of the National Artist’s work spanning from 1965 to 2015. It traces the life and oeuvre of the beloved artist from his starting years as a Fine Arts student at the University of the Philippines-Diliman, his personal journey to London, his eventual return to the country and his new life in Baguio City. Over a hundred BenCab works are displayed in the museum’s galleries, mostly belonging to private collectors and are on exhibit to the public for the first time. “BenCab: The Filipino Artist” will be on exhibit at the museum’s ground floor galleries until Saturday, February 27. 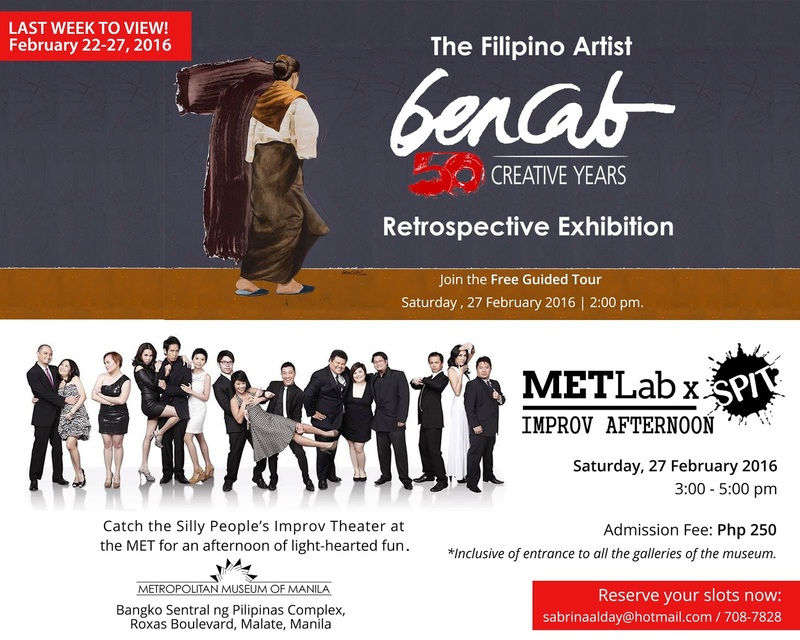 To cap off the BenCab exhibit, guests are also invited to spend the afternoon in bouts of laughter as the MET invites South East Asia’s premiere improvisational theatre group, Silly People’s Improv Theatre (SPIT) on February 27, 2016, 3-5 PM at the museum galleries. Catch their spontaneous art-themed show as they introduce the audience to the free-spirited nature of improvised theatre reminiscent of the organic exchange of ideas between artists and enthusiasts. Ticket to the event is for P250.00 inclusive of admissions fee and a free guided tour of the BenCab: The Filipino Artist exhibit at 2 PM. The Metropolitan Museum of Manila is located at the Bangko Sentral ng Pilipinas Complex, Roxas Blvd., Manila. Museum hours are from Monday-Saturday, 10 AM-5:30 PM. For inquiries, call 7087828.